Chairman, Edo State chapter of the All Progressives Congress (APC), Barr. Anselm Ojezua; former National Chairman of the APC, Chief John Odigie-Oyegun; Edo State Governor, Mr. Godwin Obaseki; his wife, Betsy; Deputy Governor, Rt. Hon. Philip Shaibu; his wife, Maryann; Secretary to State Government, Osarodion Ogie Esq. 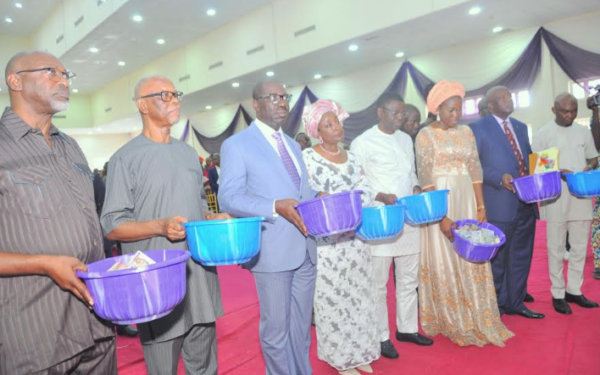 ; Chief of Staff to the Edo State Governor, Chief Taiwo Akerele, during the Inter-denominational Thanksgiving Service organised by the Edo State Government to commemorate the successful 2019 general elections, in Benin City, the Edo State capital, on Friday, March 22, 2019. Obaseki said that with the massive support given to candidates of the APC in the general elections, particularly in the state House of Assembly election, there is no excuse for non-performance on the part of the party. “Every achievement made by my administration so far has been divinely directed as God directs my everyday activity. “This victory throws up a lot more responsibility as the victory in the election shows the people trust our administration and we can’t afford to fail them. “All the 18 local government chairmanship seats in the state are occupied by members of the APC. All the newly elected 24 Edo State House of Assembly members from various parts of the state are APC members. “So with our party’s dominance of the political space, we have no excuse not to deliver. I want to rededicate myself and this administration, and reinforce our earlier promise to put Edo people first at all times and to make life more comfortable and better for them. The governor who frowned at cult-related activities in the state, vowed to deploy a mix of strategies to stamp cultism out of the state. He called on parents to urge their children and wards to stay away from cult-related activities as no one will be spared if caught in the act, adding that the necessary laws on cultism which were passed by the state House of Assembly will be effectively used. “Cultism is my next priority and we have a law on cultism in place which we will use to punish offenders. With the assistance of the Edo State Commissioner of Police, we will set up a special squad on cultism, to deal with offenders and render it history in the state,” he said. Obaseki acknowledged and applauded the support and prayers of the Benin Monarch, Omo N’ Oba N’Edo Uku Akpolo kpolo, Oba Ewuare II, which he said have played a vital role in the success of his administration. In his sermon, the Arch. Bishop of Bendel Province Anglican Communion, Friday Imeakhai, commended the governor for relying on God and making it mandatory to always give thanks to God. Represented by Ven. Joseph Osueni, he said the victory of the party in the election was divine as no party in the history of the state has won all the seats in the state House of Assembly. Imeakhai urged the governor to do more in such sectors as agriculture, education and in the provision of more infrastructural facilities. The Chairman of Christian Association of Nigeria (CAN) Edo State Chapter, Bishop Oriname Oyonnude Kure, commended the governor for his developmental strides in the state. Bakayoko to break Milan loan streak?